Protera FlexBridge℠ is a powerful migration tool that streamlines the SAP HANA and SAP S/4 HANA Migration path. Built from the ground up by incorporating years of Protera’s migration experience and best practices, Protera FlexBridge utilizes machine learning to continuously improve migration execution and provides automatic error identification and correction. 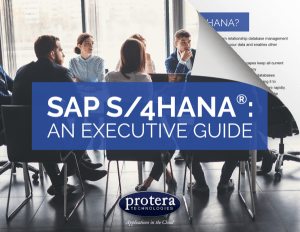 Organizations currently running their business on SAP and planning to transition to HANA or S/4 HANA will significantly reduce the cost and complexity of their migration project by leveraging the Protera FlexBridge Suite of Services and Tools. These Services and Tools are integrated in a comprehensive HANA Migration Automation platform that supports most SAP Business Suite Applications running on a large combination of OS/DB environments. Based on specific project requirements Protera FlexBridge can perform a HANA conversion in one step including; the DB migration to HANA, the OS migration to Linux, the selective upgrade of SAP Applications to a more recent version, and UNICODE conversion if needed. With Protera Flexbridge typical Migration Cost and Time savings range from 45% to 60% over a traditional approach, due primarily to the migration methodology and automation tools built in Migration Services Platform. Beyond the hard savings Protera FlexBridge also offers IT decision makers the assurance that every step of their HANA Migration project is fully planned based on SAP recommended best practices and SAP validated tool sets, and ensures that the entire migration process is fully documented, from initial migration readiness assessment to post-migration acceptance tests. The combination of Proven Methodology and Automation greatly facilitates the migration of multiple SAP landscapes in parallel and allows organizations to transition complete SAP production environments in full confidence. 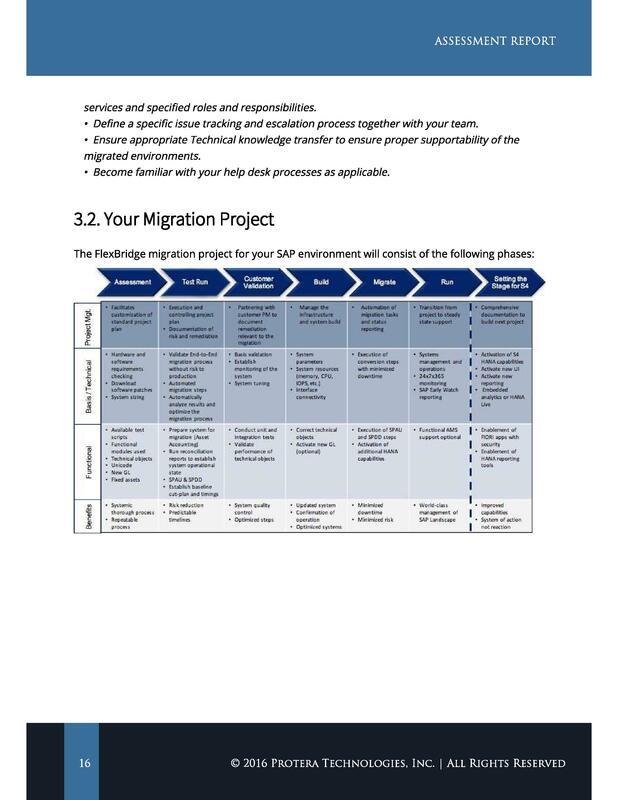 Regardless of organization size and/or industry Protera FlexBrige supports most HANA migration initiatives and situations, from initial migration PoC to complete SAP production environment migrations to HANA. 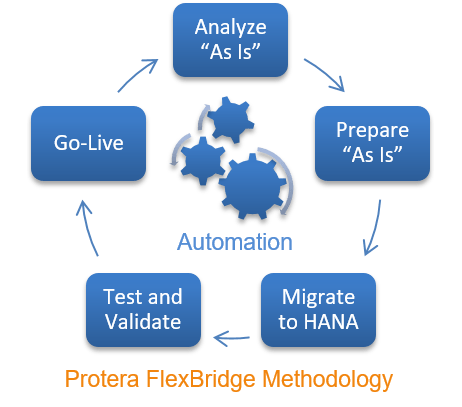 With Protera FlexBridge organizations accelerate the success of their HANA migration and deployment initiatives through every step of their HANA journeys. Our customers rely on our team to provide expert HANA migration guidance and delivery services. Validation of the full HANA migration process with no impact on existing SAP production systems. Often existing SAP customers start their HANA journey by moving a BW or BI landscape. This phase usually comes after a successful PoC or one SAP landscape migration. While HANA deployments run on a defined and limited number of Linux systems, source systems run on a large variety of OS and DB environments. Below is a summary of the environments Protera FlexBridge support. Fitch Ratings Selected Protera for the migration of the SAP systems to HANA in the cloud. “By leveraging Protera FlexBridge the project team completed the migration of multiple SAP systems from a legacy OS/DB stack to HANA on SUSE Linux in the cloud in under 3 months. Business disruption was minimal, the project required only one short downtime period”. Protera FlexBridge. Reduce the complexity, cost and downtime of your SAP cloud migration by nearly 70% simply by leveraging Protera’s FlexBridge Migration Acceleration Services Platform. 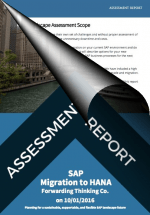 To get started Protera offers a SAP HANA and SAP S/4 HANA Migration assessment of your existing SAP environment – the assessment includes a detailed report with a comprehensive list of current performance, usage metrics, and recommended migration plan. Protera FlexBridgeSM is a registered service mark of Protera Technologies, Inc.